All Fired Up Fire Services is FPA Code of Practice Compliant. The Department works in consultation with the fire protection industry and FPA Australia members. We are supported by the FPA Australia Board, the National Technical Advisory Committee (NTAC), the Technical Advisory Committees (TACs), Special Interest Groups (SIGs), State Divisional Committees and other relevant stakeholders. All Fired Up can arrange staff fire safety briefings and training including fire warden training to ensure all staff are trained, aware of how to use the equipment installed on site and what to do in case of fire. All Fired Up will provide comprehensive evacuation plans and install them on site visible for all staff, visitors or residents. All fired Up offer an onsite fire safety training option to all our valued clients. Our team will design a tailored fire safety training program specifically suited to your workplace and deliver the training onsite. 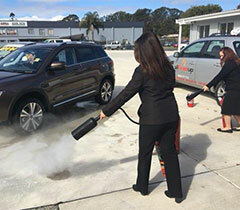 Included in the training programs are the hands-on use of many different fire extinguishers and what extinguisher is best suited for different fires. 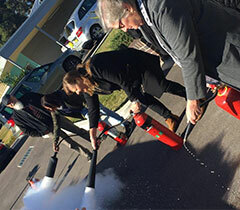 Hands on fire safety gives staff an opportunity to experience how a fire extinguisher reacts when you pull the pin and squeeze, thus people are more prepared encase of fire. The correct use of a fire blanket is vital and is often a neglected component of training. Our training provides a practical demonstration on the use of a fire blanket and what to do if someone is on fire. Included in the training is office and workshop hazard reduction awareness, including simple things to look out for including overloaded power boards or piggybacked double adaptors. All Fired Up can offer training on the benefits of smoke detectors ,sprinklers systems and how to correctly use a fire hose, including Fire safety preparation and emergency response procedures. All Fired Up offers evacuation training including evacuation plans and fire warden training. Having your team learn how to keep themselves and others safe on site makes good sense. People in a familiar environment are more likely to be confident to react if an emergency arises. Call us on 43650888 to discuss onsite Fires safety training for your business.